Martin Braun family of astronomical complications is for the most part named for figures from Greek mythology, the classical legends fittingly correlated to the classic timepieces. Eos (2001) was the Greek goddess of the sunrise and the matriarch of Martin Braun’s now legendary family. Her child, Boreas (2003), was the Greek god of the north wind. Astraios (2005) was Eos’s husband and the father of her children, including Boreas. In 2008, Kephalos entered the scene. Somewhat of a rascal, Kephalos was Eos’s mythological lover. 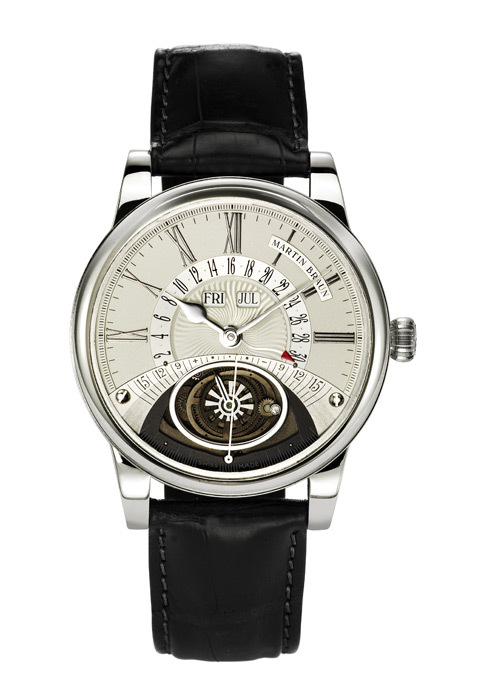 Now this unique model has been extended to include the function of the Heliozentric, which made its debut in 2004, and the equation of time display first seen in the Boreas. Martin Braun’s original Kephalos model debuted in 2008 and included a brand-new retrograde moon phase. 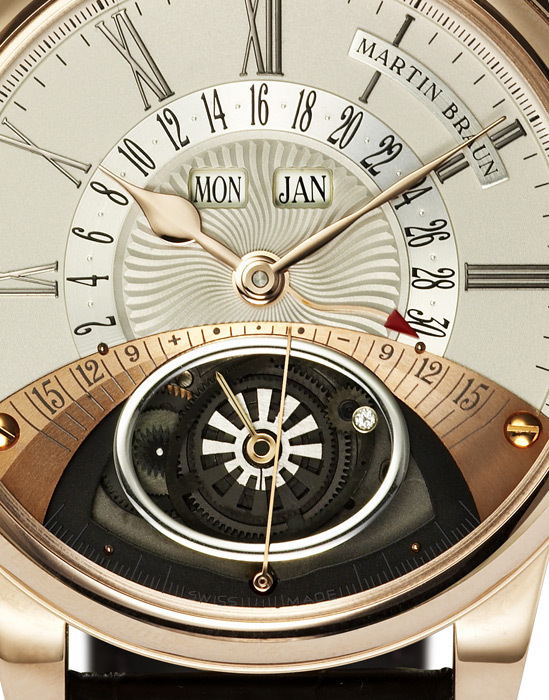 Though this new variation on the theme no longer sees the moon, it does include other functions that truly deserve being called “complications,” among which is Martin Braun’s first annual calendar, which features a retrograde date display. An annual calendar describes a mechanism that automatically takes into account the length of the month, even moving to the next after a shorter 30-day month without having to manually correct the window to reach the “1” of the next month. It is only on March 1 that one must correct the date after February is over. However, during the leap year—which occurs every four years—the system does automatically correct the date, meaning that the wearer only has to correct February on this watch three times in a four-year period. 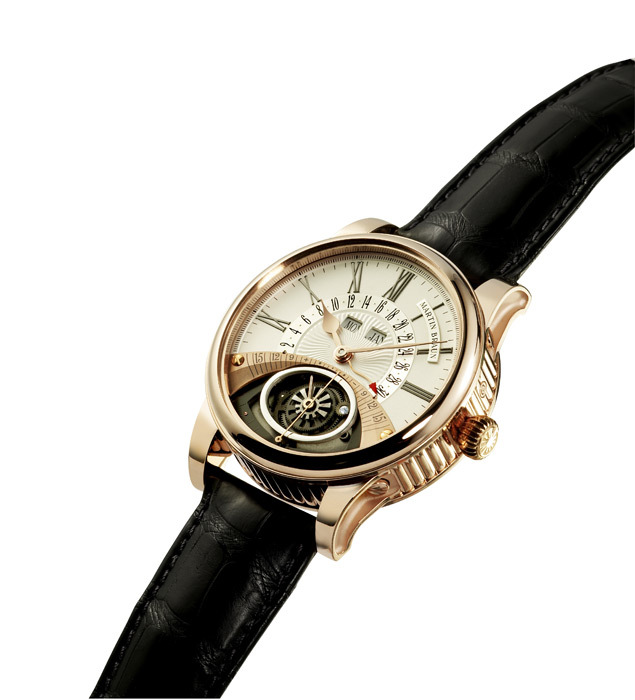 The Heliozentric was an astronomical complication new to the world of watchmaking in 2004. The original task Braun had set for himself was to display the position of the earth in relation to the sun. It is widely known that our earth moves in an elliptical orbit around the sun and that, logically, at the same time every year the earth moves into the same position in relation to the sun. Representation of the relationship between the sun and the blue planet we call home can be resolved in many different ways on a watch dial. One could, for example, have the earth move around the dial on a type of track system, but Braun felt that he could make the display even more visually intriguing for the watch aficionado. For this reason, Braun set to the task using both advanced mathematics and classic mechanics, creating a gear to generate a curve, or more precisely a cycloid, for the oval. The central sun wheel turns twice a year, and a carrier with three planetary wheels makes an annual revolution, all counterclockwise, with both of the main wheels engaging each other. A symbolic earth located on one of the planetary wheels illustrates the planet’s elliptical orbit. This orbit moves completely naturally in a counterclockwise direction, as it is found in nature. Braun amended one physical detail to improve the dial’s optics. The earth rotates around the sun in an elliptical orbit, and the sun in all reality is positioned in one of its focuses according to the First Law of Kepler. However, Martin Braun decided to place the sun centrally within the ellipse for aesthetic reasons. “An off-center sun variation really aggravated the dial’s aesthetic visuals,” Braun explains. 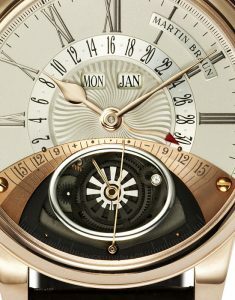 The Kephalos Heliozentric also includes what became one of Braun’s signature complications early on in his career as the head of a brand: the equation of time, seen here as the border between the calendar and the position of the earth. The equation of time indicates the difference between mean and solar time. A small hand travels across the arched scale to display a difference of up to plus/minus sixteen minutes in relation to the mean time shown by the hour and minute hands. This is a rare complication in watchmaking, and the solution to its mysterious function can only be found in this timepiece: the bearing plate for the Heliozentric system doubles as the equation disk—which precludes it possessing the correct shape—and is thus used as a cam. The Kephalos Heliozentric is housed in Martin Braun’s signature case: an impressive 44 mm in diameter, it includes the striking coin-edge case band fans of the brand have come to know and love. The lugs are screwed through to the movement holder inside the case. This safety system avoids shifting inside the movement should the watch be subjected to shock and guarantees that the system can be perfectly centered during assembly. Gaskets underneath the screws also guarantee that the case is water-resistant to a minimum of 50 meters. Like on all Martin Braun cases, the bezel is screwed down to preventing it coming off by accident should the watch be subjected to rougher treatment.